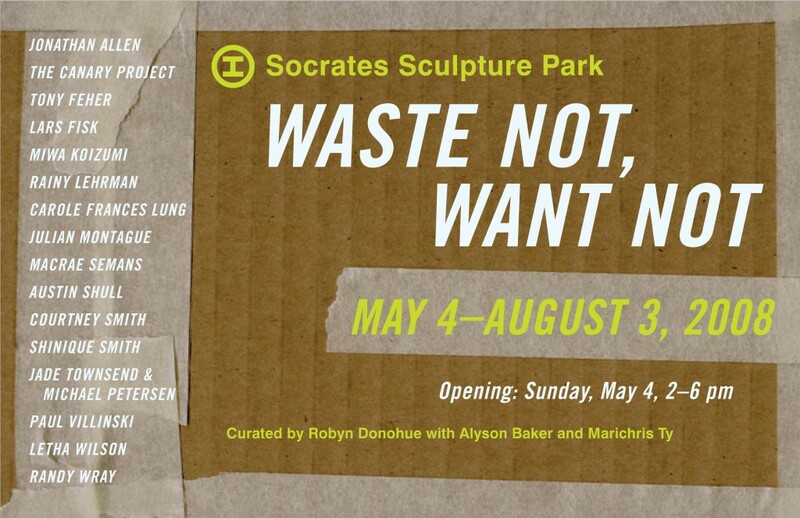 Curated by Robyn Donohue, with Alyson Baker and Marichris Ty, Waste Not, Want Not is a group exhibition themed around the interpretations and responses to the motivations, goals, realities, politics, and practices of recycling. It is an expansive exhibition encompassing many perspectives about the concepts and methodologies of adaptive re-use, and includes projects that address the creative transformation of the by-products of production and consumption. Whether celebrating the global trend toward “green”, or critically examining the motives and results of a world-wide focus on sustainability, the works in this exhibition share a common practice of re-purposing wasted or cast-off resources. The opening reception will feature a 4pm performance by The Canary Project, titled Albedo Pilgrims Make A Landing. The Canary Project, whose mission is to bring awareness to the issues of climate change, will install a series of braided ropes made of white work shirts — in the tradition of Shimenawaa Shinto ceremony. Wearing white is a symbolic effort to increase the reflectivity of the Earth and decrease global warming. Carole Frances Lung’s interactive Walking & Weaving project is an attempt to map and analyze the cultural detritus of the global textile and garment industry through the process of generating a bricolage woven cloth. Her production method consists of: walking the grid of the New York City’s garment industry, scavenging raw materials, and collecting donated used garments by the inhabitants of the City. Carole invites people to bring their used garments and textiles to the Park from May 4-June 1, and will then perform the labor of weaving this cloth Tuesday-Sunday, June 1-22, 10AM-7PM on a 7′ x 7′ warp weight loom. Other projects include: Tony Feher’s (Lipstick Showing), a discrete and humorous intervention employing a formal economy of found materials; The Things You’ve Had, for which Jonathan Allen cut and recycled used car, beer, airline, and movie billboards into a surreal 10′ x 28′ collage; Lars Fisk’s six-foot high Trashbags, carved from a single block of marble, presenting a paradox of their disposable transience and lasting materiality; Miwa Koizumi’s Plankton->fuel->plastic->rubbish: Taking my plastics back to the fuel drum, three ethereal seascapes highlighting a geological timeline of sea life becoming a source of fossil fuel for consumption and eventually being used in the production of the water bottles from which this sculpture is made; Rainy Lehrman’s 30′ wall of compacted sawdust focusing on the waste created through the labor of woodworking; Julian Montague’s Three Stray Shopping Cart Situations, a series of tableaus that recreate the settings in which the abandoned carts were found; Macrae Seman’s meticulously arranged, monumentally scaled still life of salvaged materials and found parts including wood, stone and metal components; Austin Shull’s Migratory Greenhouse, are-outfitted Mazda pick-up turned self-sufficient greenhouse, addressing issues of subsistence and sustainability within an urban context; Courtney Smith’s large-scale mosaic made from old doors whose colors, moldings and remaining hardware give the piece a remarkably varied surface; Shinique Smith’s installation, October Floor, composed of pieces of reclaimed linoleum and carpet, forming a blanket laid out on the ground on which she has placed a set of disparate items, including bricks, bowls and a legless chair; Letha Wilson’s Gallery Garden (Jasper Johns), a seating area and multi-level planter for native grasses and flowers, created from discarded gallery and art fair walls; Jade Townsend and Michael Petersen’s installation made from wood and other materials salvaged from the hastily built and short-lived sets that are created for photo shoots; and Randy Wray’s Port, a series of colorful abstract sculptures made from shredded junk mail and presented in the style of a Zen rock garden.